Along with a strong Social Media presence through Twitter, FaceBook, YouTube and Instagram, the 2nd World Seabird Conference received the following traditional media coverage. The conference began with a welcome opening address by Jane Goodall and the conference concluded at the banquet dinner with the attendees completing the challenge Jane put forth of hearing everyone’s seabird sounds. Videos of Jane Goodall’s opening remarks along with other interesting WSC2 videos can be viewed on the World Seabird Union YouTube Channel or by clicking on the video of interest below. 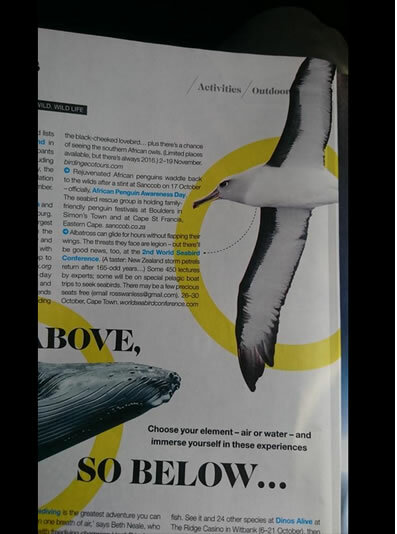 The 2nd World Seabird Conference even received mention in British Airways in flight magazine!